Next week KNAW Visiting Professor Christine Borgman (UCLA) visits DANS and the eHumanities group. 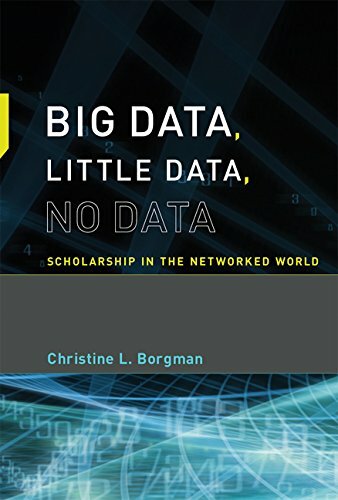 On Wednesday, June 17, 15-17, Professor Borgman will present her new book “Big Data, Little Data, No Data: Scholarship in the Networked World”, and give an update of her on-going research projects. Her lecture will take place at DANS, The Hague, Anna van Saskenlaan 51. Please let Dirk Roorda know (<dirk.roorda@dans.knaw.nl>) if you will participate. “Big Data” is on the covers of Science, Nature, the Economist, and Wired magazines, on the front pages of the Wall Street Journal and the New York Times. But despite the media hyperbole, as Christine Borgman points out in this examination of data and scholarly research, having the right data is usually better than having more data; little data can be just as valuable as big data. In many cases, there are no data—because relevant data don’t exist, cannot be found, or are not available. Moreover, data sharing is difficult, incentives to do so are minimal, and data practices vary widely across disciplines. Borgman, an often-cited authority on scholarly communication, argues that data have no value or meaning in isolation; they exist within a knowledge infrastructure—an ecology of people, practices, technologies, institutions, material objects, and relationships. After laying out the premises of her investigation—six “provocations” meant to inspire discussion about the uses of data in scholarship—Borgman offers case studies of data practices in the sciences, the social sciences, and the humanities, and then considers the implications of her findings for scholarly practice and research policy. To manage and exploit data over the long term, Borgman argues, requires massive investment in knowledge infrastructures; at stake is the future of scholarship.